I was sorting my records over the weekend, and came across this 45 with no cover, just a paper sleeve. So I searched my memory banks and discovered that this is my dad’s high school band! He’s on drums. It’s from 1965, which I believe was his senior year. They called themselves The High Numbers, which is a name totally stolen from The Who (The Who temporarily changed their name to The High Numbers at one point). From what he’s told me, he played in a couple other bands in high school, one of them was called The Gratzmen (My dad’s name is Alan Gratzer, and he was pretty charismatic and funny and took a leader role in bands). But I don’t think those other bands recorded anything. After high school, he attended the University of Illinois. During the first year he and his dorm mate, Neil Doughty, started REO Speedwagon. And my dad was the drummer of REO for the next 21 years. Here is a picture of him from the back cover of REO’s first album. And here he is rocking out in the early ’80s! 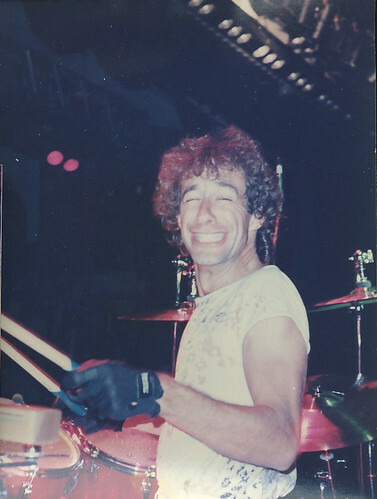 In the very early days of REO (and in earlier high school and college bands), he would sing and play drums. But no recordings from those times were ever made. And he’s bummed out about that. But still, it’s nice to have at least one 45 from the pre-REO days. This record contains two songs – High Heel Sneakers, and I’m A Man. Both are blues-driven pop songs. The recording is not the greatest, but that’s part of the charm! As only 100-200 of these were pressed in 1965, the chances are great that none of you have ever heard this record (I doubt my dad’s even listened to it in over a decade). So, here you go! I recently picked up In/Humanity‘s Gets Killed by Robots 7″. Previously, I’d only heard a couple songs of theirs from comps (Amnesia, and I Can’t Live Without It), and while I liked those songs, I failed to seek out more. But this 7″ is rad. So here it is! Also, you can snag their entire discog from Illogical Contraption. Apparently it was mixed differently than the original material – so that’s, in part, why you may want to d/l this 7″ in addition to getting the discography. In an interview, the singer, Chris Bickel, says that this 7″ marks the point where In/Humanity first started getting good. It’s sort of wild, and artsy/unusual, loud/soft (emo violence! – Bickel’s terms). Reminds me a bit of Assfactor 4 crossed with Hose.Got.Cable. This came out in 1994. Excuse the crackles. And I scanned the insert. It has some cool stuff.